A Year of Being Here: Rosemary Royston: "Why You Should Go Outside at 4:40 amin November"
"Why You Should Go Outside at 4:40 am in November" by Rosemary Royston. Text first published by Town Creek Poetry (Spring 2013). Reprinted here by permission of the poet. Rosemary's chapbook, Splitting the Soil (2014), is available through Finishing Line Press. 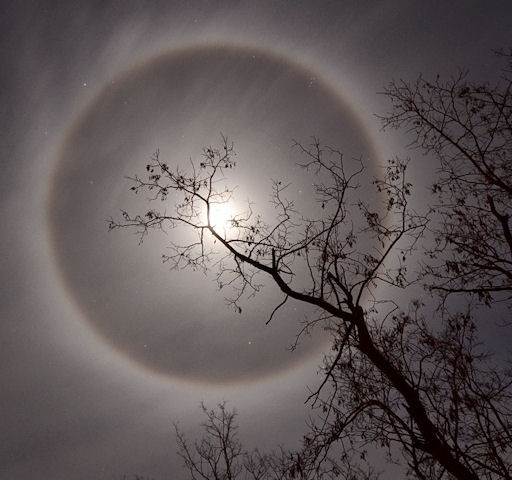 Art credit: Untitled image of an ice halo around the moon, by unknown photographer. Thank you for sharing your beautiful poem with us, Rosemary! I love the ending of this poem. I am sure I'd feel that way if I had seen this. Peg Runnels: "I Want My Grief"
Thomas Merton: "When the Shoe Fits"
January Gill O'Neil: "How to Make a Crab Cake"
W. S. Merwin: "To Myself"
Julia de Burgos: "I Was My Own Route"
Billy Collins: "This Much I Do Remember"
Ron Stone:"Memo to SelfRe: Meditation"
Jalal ad-Din Muhammad Rumi: "Zero Circle"
Charles Bukowski: "helping the old"
Barbara Crooker: "It's Monday Morning,"
Wendell Berry: "Sabbaths 1999, VII"
David Lee: "November Idyll: After the still life"
Annie Lighthart: "The Second Music"
Phil Hey: "Spring forward, fall back"